Woo! lol I am in a really Christmassy mood today and you know why? Because I saw the Coca Cola advert on telly! I think everyone should watch it as it will put you in a great mood all day. 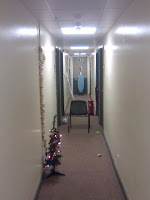 Lol, I also came back to a very random scene in the hallway to our flat. Don't ask I have no idea why it was like that? The next day our little Christmas tree had disappeared? Someone stole it! So I have a shoot booked for Tuesday now :) Should be a fun day! I have to go to Manchester on Monday again to renew my health cert so hopefully everything will go to plan and I will get my results back on time! I'm off to see Jimmy Carr on Friday night in Wolverhampton with the boyfriend so I'll be sure to let you know if I meet him! (Jimmy Carr that is) I think it will be a very funny night.